Early last year, along with all the rest of America, I was excited, dumbfounded, and a little nervous when Harper Lee announced she was publishing another novel - more than 50 years after her iconic To Kill a Mockingbird. There were rumors that the reclusive 89-year-old Lee, nearly blind and deaf and in poor health, was getting bullied into publishing an earlier draft of what, after much editing and many revisions, eventually became Mockingbird. The recent death of her sister and longtime protector, Alice, and the fortuitous "discovery" of the manuscript by a lawyer at the firm where Alice worked, added to the concerns that this wasn't necessarily in line with Harper's intents or best interests. But I tried to give the situation the benefit of the doubt and looked forward to seeing what Lee's "sophomore" effort would be. Unfortunately, I have to say, I was not particularly impressed with Go Set a Watchman as a stand-alone novel. It raises some interesting questions, however, as an extension of and reflection on Mockingbird, Scout and Atticus. 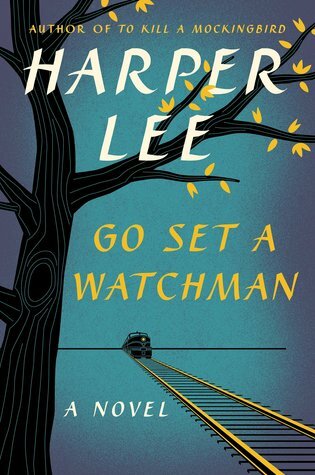 First of all, while there are moments in Go Set a Watchman that pulled me in, I didn't feel connected to Scout - sorry, Jean Louise - or Atticus or any of the characters I knew from To Kill a Mockingbird, though I was sad about Jem's absence. Of the new characters, Henry Clinton, Jean Louise's longtime friend and sometime beau, intrigued me most with his endearingly constant pursuit of Jean Louise and his struggle to overcome his "white trash" roots. As its own story, Watchman lacks the depth and polish that came to Mockingbird through the extensive editing process. Especially toward the end of the novel, the dialogue in Watchman turned into speeches, the action seemed rushed, life-changing epiphanies dropped left and right with little time or effort to process them between the swings of extreme emotions, and then it just ended. I wanted more. More nuance and more growth. More of Jean Louise fighting to reconcile the men she loved with their beliefs she found abhorrent, more of her internal struggle to determine how best to move forward and how their relationships should change, more of a sense of direction from her for the future. The character development and emotional investment all happened in Mockingbird. Watchman was just kind of riding Mockingbird's coat tails. It simply doesn't work as its own story, despite having been written first. Watchman was better as a commentary of sorts on Mockingbird. Scout's idealism and "colorblindness" runs up against her father's and Henry's resigned pragmatism and casual racism, sparking her true adulthood, her first real separation from the father she worshiped. Like Scout realizing that the father she had built up in her mind as the epitome of perfection - in a way denying both him and herself their true, nuanced humanity - was actually only human after all, we readers were faced with the unpleasant rounding of a character we had learned to idolize from our middle school English classes. It's valuable to be reminded that no one is either all good or all bad and that every single person we meet is more complicated and real than we often give them credit for, though that is also often a painful realization. I'm all for complex characters and had little difficulty accepting the characterization of Atticus that included some of the more benign-seeming but insidious racist attitudes of the time, cloaked in a mantle of respectability and reasonableness (though I found her Uncle Jack's method of "attract[ing] her attention" and his complaint that "it takes it out of you" incredibly distasteful). But Watchman preached where Mockingbird simply showed. And Mockingbird, not Watchman, is rightfully Lee's landmark novel on race relations. I found myself thrilled to be re-immersed in the voice of Harper Lee. The idea of this being written first, and editors seeing the potential where it lay in the children of this text, I enjoyed this visit to the less-polished path to literary greatness.